Animal You | Boa Constrictor | The Boa constrictor is a large snake, although small in comparison to other large snakes such as the reticulated python and the Burmese python, and can reach a length of 3 to 13 feet (0.91 to 4, 0 m) depending on location and the availability of suitable prey. It is clear sexual dimorphism seen in the species, females are generally larger in length and width than males. As such, the average size of a mature female boa is between 7-10 feet (2.1 to 3.0 m), while it is 6-8 feet (1.8 to 2.4 m) for males. A report of a Boa constrictor growing up to 18.5 feet (5.6 m) was later found to be a misidentified green anaconda.The Boa constrictor is a snake body thick and large specimens can weigh up to 27 kg (60 lb). 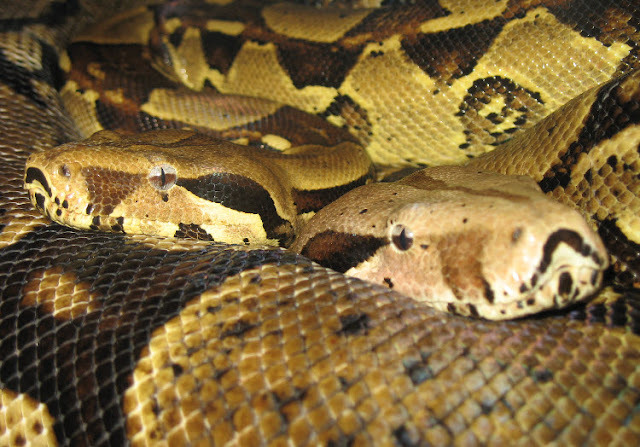 The size and weight of a subspecies Boa constrictor depends on the local availability of suitable prey. Several populations of Boa constrictors are known as "dwarf boas", since the population of B. c. imperator Hog Island. B. c. constrictor itself reaches, and sometimes above the averages above, because it is one of the relatively large boa subspecies. Other examples of sexual dimorphism in the species include the fact that men generally have longer tails to contain the hemipenes and also longer pelvic spurs, which are used to grip and stimulate the female during mating. Pelvic spurs are the only external sign of the rudimentary back legs and pelvis, seen in all boas and pythons. 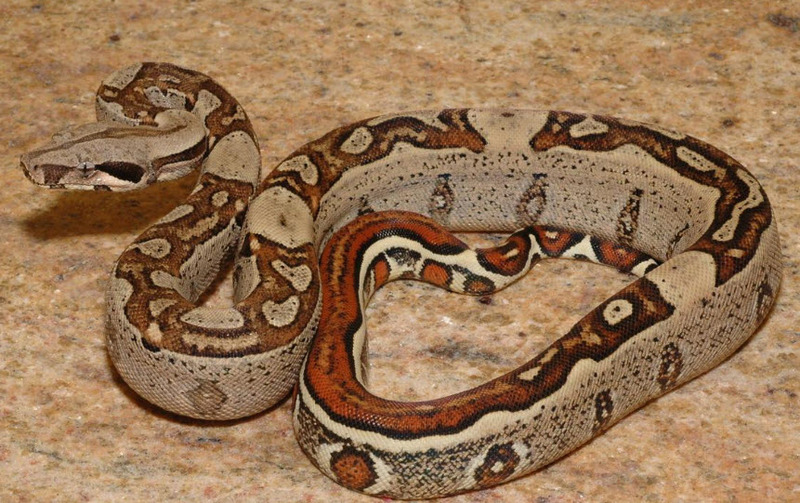 The coloration of Boas can vary greatly depending on the locality. Boa constrictor has an arrow-shaped head that has very distinctive stripes. Boas also have two lungs, a smaller (non-functional) left and enlarged (functional) right lung to better fit their elongated shape, unlike many colubrid snakes which have completely lost the left lung. 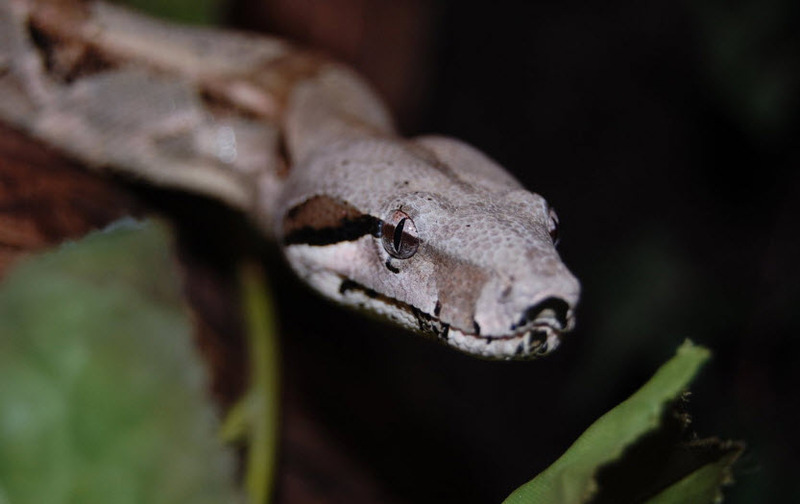 Boa constrictor flourishes in a wide variety of environmental conditions, rainforests to arid semi-desert country. Boa constrictor will also occupy the burrows of medium-sized mammals, where it can hide from potential predators boas are ovoviviparous, giving birth to live young. Generally breed in the dry season, between April and August-and are polygynous, thus males may mate with several females. In 2010, a boa constrictor has been shown to have reproduced asexually by parthenogenesis. During the breeding season the female boa emits a scent of her cloaca to attract males, which can then fight for the right to reproduce. During the breeding season, the male tail curling around the female and hemipenes (or male reproductive organs) are inserted. The gestation period is counted from the delivery after ovulation is 100-120 days. The female gives birth to young that average (15-20 cm 38-51 cm) long. The litter size varies between females, but can be between 10 and younger, with a mean age of 25 65, although some young people may be born dead or unfertilized eggs known as "slugs". 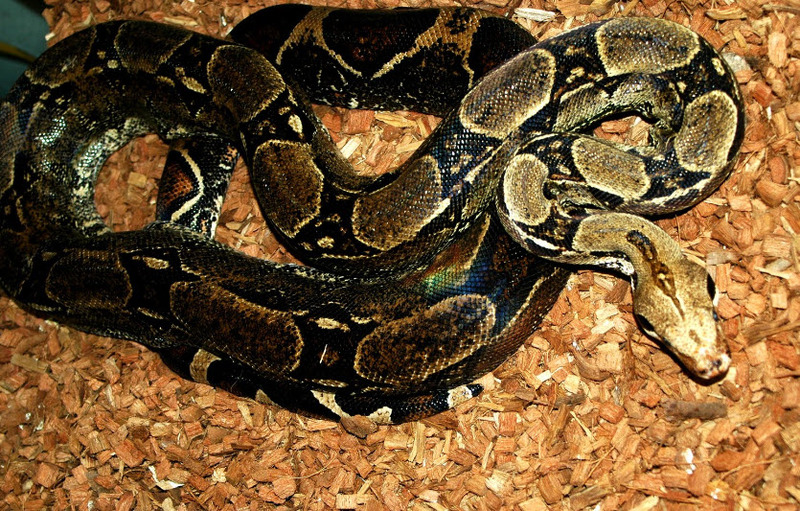 Boa constrictors are very popular in the exotic pet trade, and both were captured in the wild and captive bred. Today most captive Boas are bred in captivity, but between 1977 and 1983, 113,000 live Boas were imported into the United States. These huge numbers of wild caught snakes have put considerable pressure on some wild populations. After the reticulated python snake Boas are most commonly killed for snakeskin products, such as shoes, bags and other items of clothing.